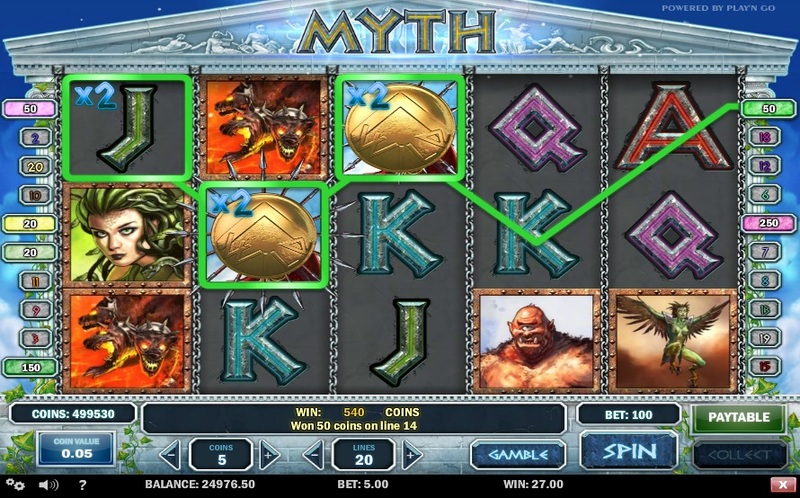 Myth, an online video slot developed by PlayNGo, gives players an entertaining and lucrative way to learn more about Greek mythology. The slot has a delightful top jackpot of 5,000 coins. In addition, it offers free spins and multipliers to help players plump their bankrolls. Myth is played the same way other PlayNGo slots are played. Players have to place a bet, click on the Spin button, and collect payouts for winning combinations. Myth comes with 20 paylines and players can use the plus and minus signs on the Lines button to select the number of paylines they would like to play. They can bet up to five coins for every active payline and choose from coin values that range from $0.01 to $0.25. If players hit the Bet Max button, they will be betting $18.75 per game, which makes Myth an ideal slot for low rollers. Myth also comes with an Autoplay feature that eliminates the need to spin the reels manually. Players can also alter the game settings to customize their gambling experience as they please. The PlayNGo slot Myth, as its name suggests, is based on mythological creatures, especially those in Greek mythology. Accordingly, the reels are packed with symbols from Greek mythology. Players, however, need not be familiar with Greek mythology to play and enjoy this slot, which features attractive graphics, exciting sound effects, and smooth game play. The wild symbol is also a multiplier. It can not only help players complete winning combinations by substituting for all symbols except the scatter symbols, but also doubles payouts. The wild symbol also holds the key to the top fixed payout of 5,000 coins. If players land a combination of five wild symbols along an active payline, they can take home the top fixed payout. The Golden Vase scatter symbol pays irrespective of its location on the reels. Players can use it to win some generous scatter payouts. They can also use it to unlock the free spin round, which offers 15 free spins with tripled wins. If players land at least three scatter symbols anywhere on the reels, the free spins bonus round gets activated. The good news is that players can re-activate the free spins bonus round while playing a free spin. One of the simplest slots in the PlayNGo portfolio, Myth is ideal for those who are just learning how to play slots. There aren’t too many bonus features to confuse players. At the same time, there are lucrative features such as free spins, multipliers, and wild symbols, which will help players win much more than the promised top fixed jackpot of 5,000 coins. Interested players can play Myth slot either for fun or for real money at any online casino that offers PlayNGo slots in its portfolio.